Austin is one of my favorite cities in America, and a place I hope to live one day. I’m lucky to have family there’s that shown me all the wonderful places (and the food! THE FOOD) beyond “Dirty Sixth”, a.k.a the strip of downtown bars that I’d often be relegated to when visiting during South by Southwest. 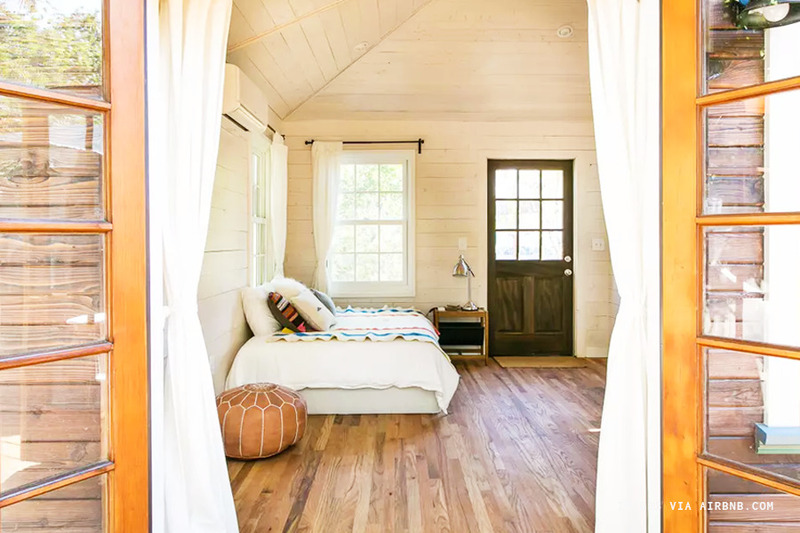 Austin is definitely worth visiting outside of the festival season mayhem, especially so that you can have the time to truly explore and take advantage of the incredible hill country nature. 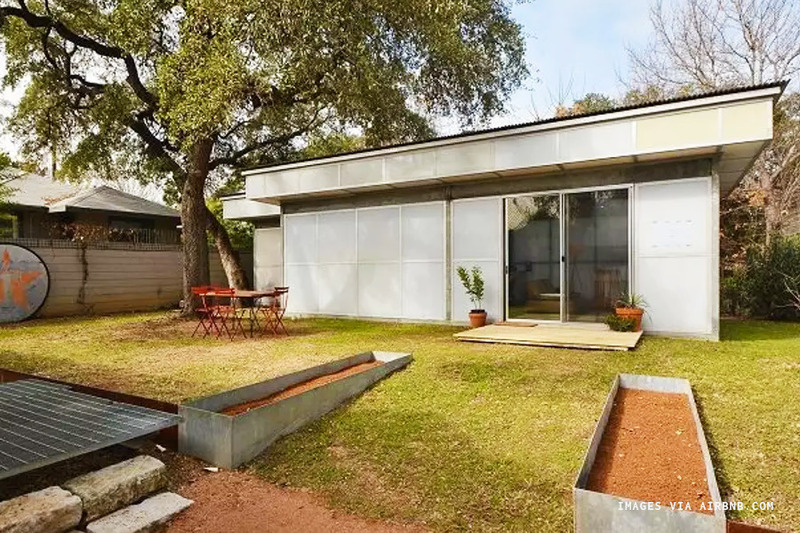 If there’s any city in America where you can’t go wrong on Airbnb— it’s Austin. Ironically, I still managed to somehow ‘go wrong’ here— but more on that later. 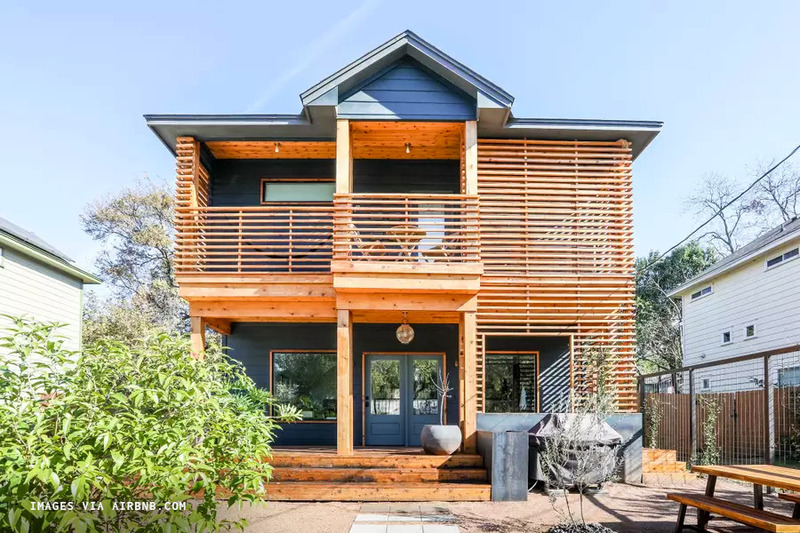 The quality and inventory of Airbnb homes in Austin is unlike any other place I’ve travelled to, so much so that this list is going to be longer than usual and I decided to dedicate a section exclusively to my top Austin Airbnb picks. 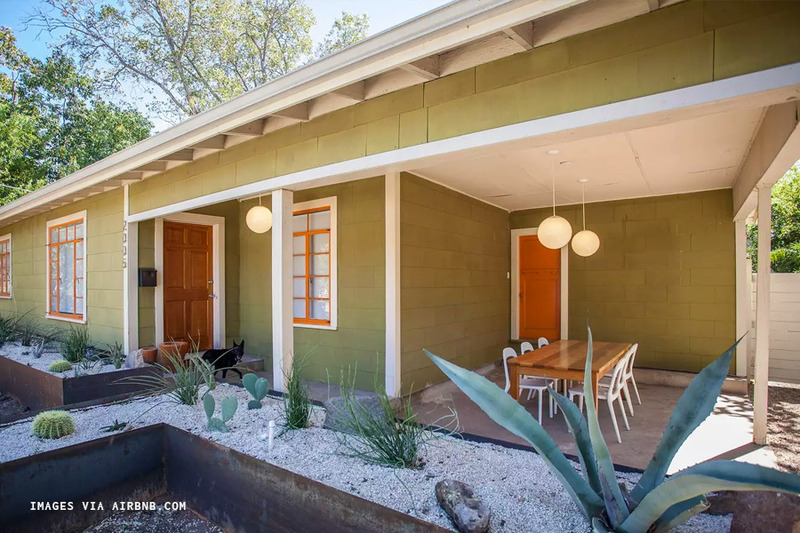 While there are many modern new developments on Airbnb that provide for a perfectly comfortable and clean place to stay in Austin, I tend to gravitate towards the places that show off more of the city’s weird personality and history. This often means homemade “tiny” homes (bigger than my NYC apartment), vintage airstream trailers, and mid-century modern architecture. The trade off is that some of these options may not be as wheelchair friendly. 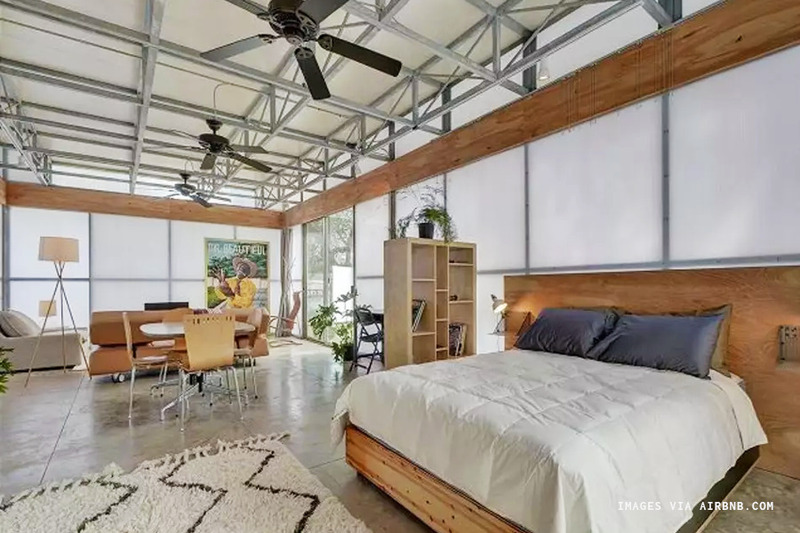 Probably one of the most unique Airbnbs I’ve seen on the entire site. 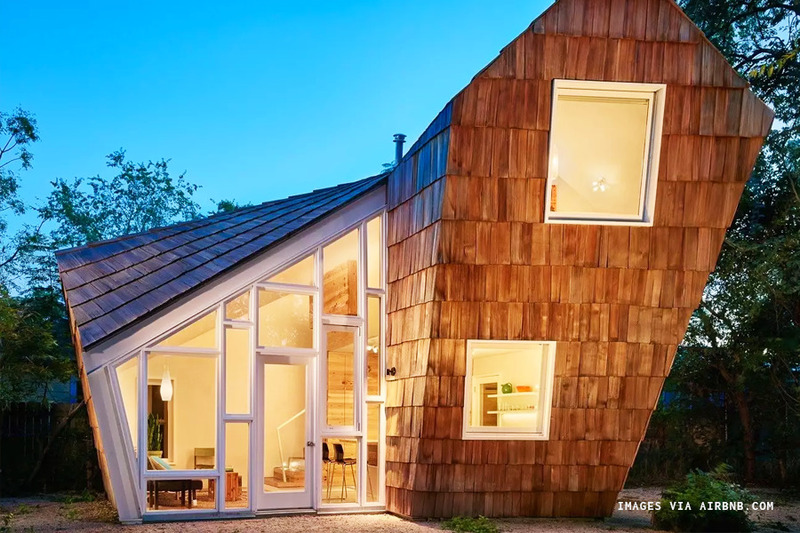 The unusual space is the result of designing around city codes and regulatory constraints and many of the materials used were salvage, like the exterior shingles which came from an old home that was remodeled years ago. 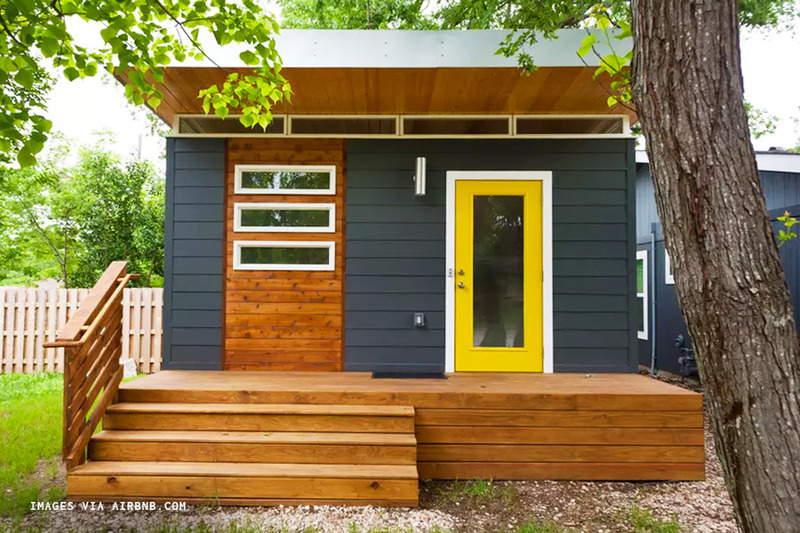 Despite being a part of the “tiny house movement” this home feels spacious and bright, and is perfectly located in Austin’s East Side. Another home that manages to nail the trade-off between natural light and privacy. 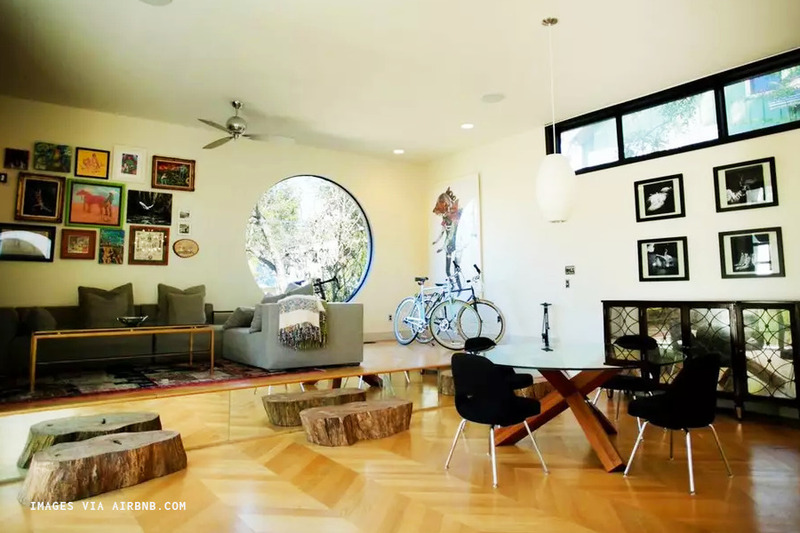 I love the layout of the home, which is almost like a small, modern warehouse. 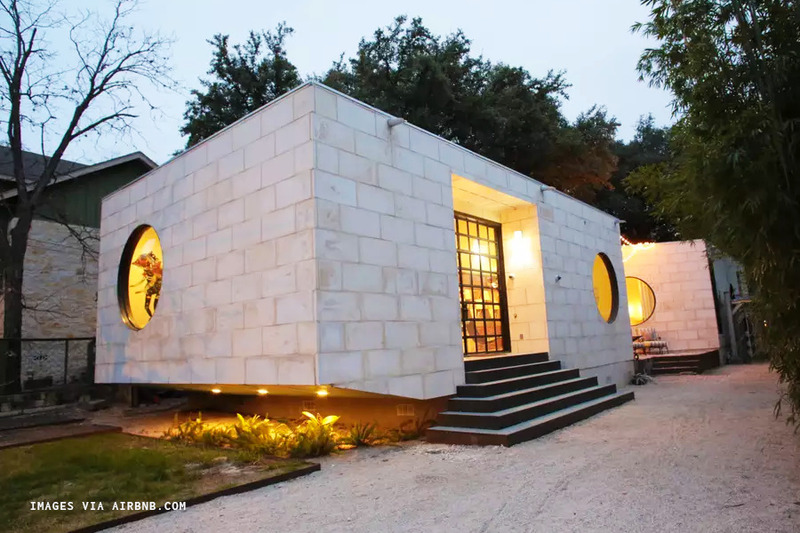 It’s located near the popular South Congress ave and close to Austin’s amazing outdoors areas like Barton Springs, Zilker Park, and Lady Bird Lake. 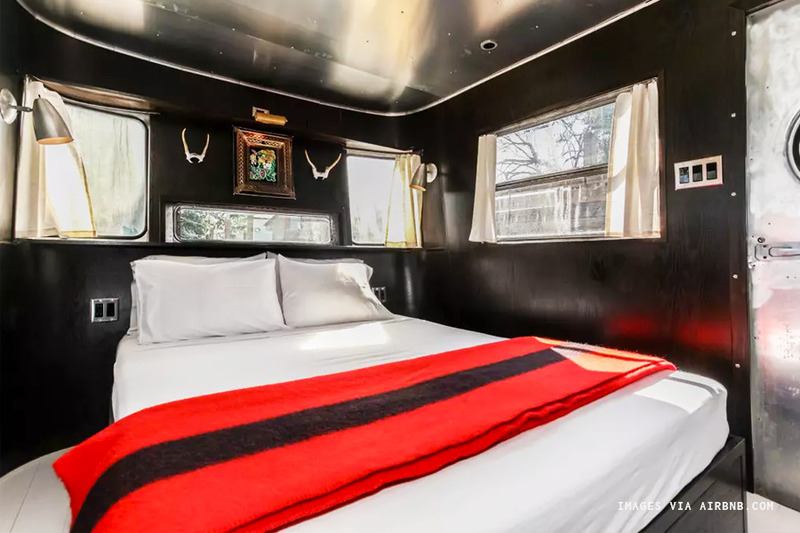 Most airstream trailers I’ve seen on Airbnb tend to lean fully into a 60s or 70s aesthetic but this one is refreshingly modern without sacrificing personality. The original interior was actually burned out in a fire in the 60s so as a homage the owners refinished many of the walls with burnt cedar, using a Japanese preservation technique known as Sho Sugi Ban. A Caveat: Remember how I said “it is possible to go wrong with an Airbnb in Austin”? The Last time I was in Austin I stayed in an airstream trailer (not the one listed above). It was beautiful, had friendly hosts, great reviews, but… while there we had a few days of heavy rain and what tends to happen with those is that bugs (like roaches) want to come indoors, and it’s easier to get inside an airstream trailer compared to a house. I mean, it’s just the way mother nature works and you can’t really get mad at anyone (the hosts or the bugs) for it. But it is something to keep in mind. Check the weather before booking, and if you’re not squeamish around bugs this may not be a big deal at all! 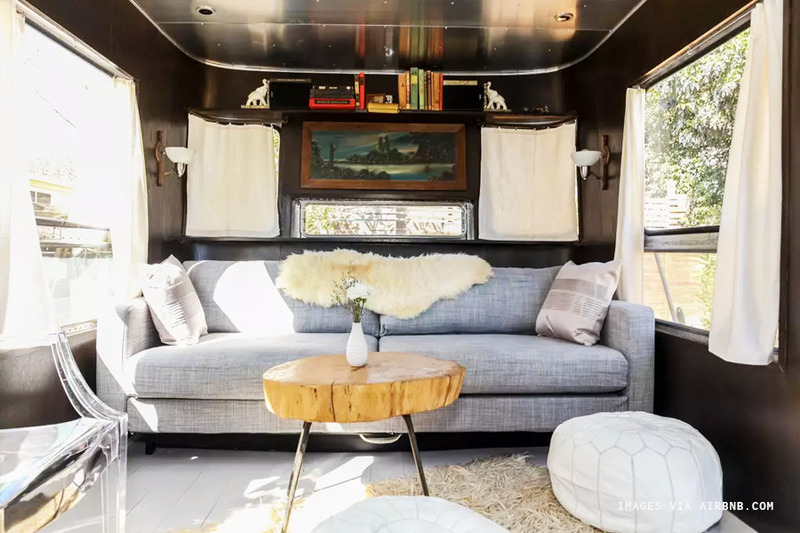 Personally, I think I can check off staying in an airstream trailer off my list for awhile. Look y’all, I’m a sucker for a well-tiled bathroom and this is one of those. 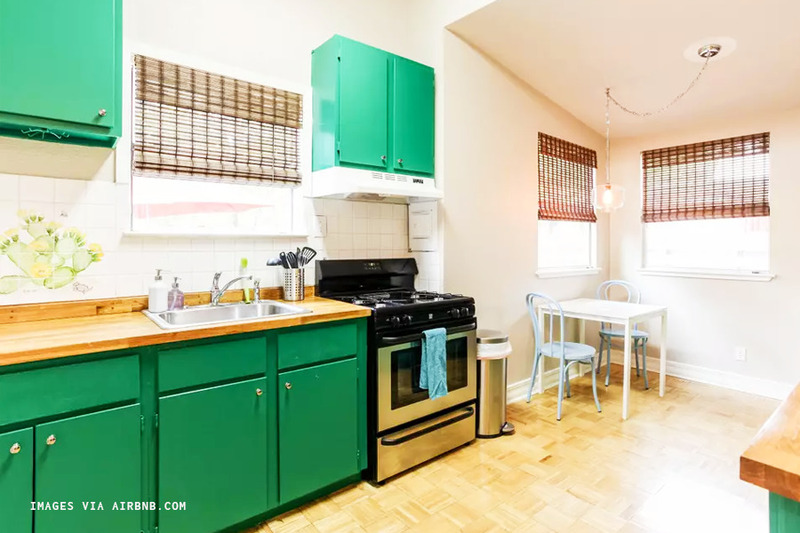 This little studio home is located in the back of a garden/farm in North Loop, and walking distance to several restaurants and bars. While it would be a cozy fit for two, I think it’d be even more perfect for a single adventurous soul. 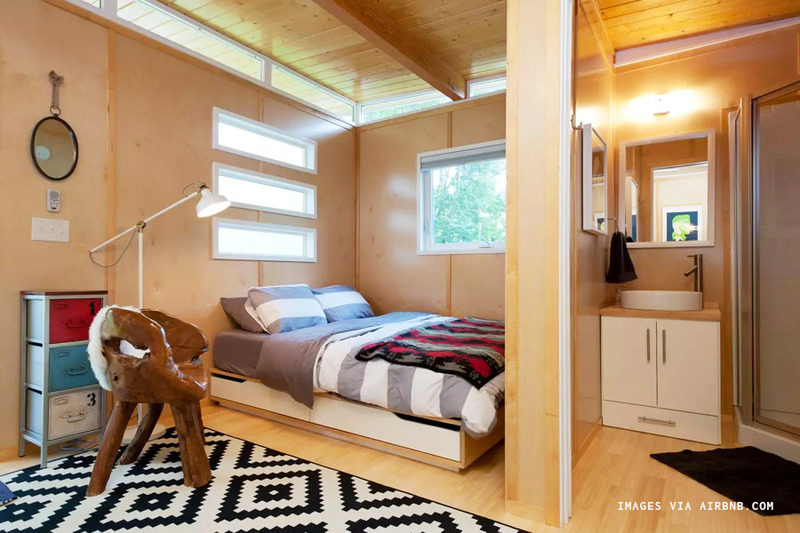 This quintessential tiny home comes with its own porch and a full kitchen, which is perfect if you want to save money on eating out. It’s located in the trendy but quieter residential neighborhood of Windsor Park. I also love how the design of the building lets in light while still feeling private. For the price, I don’t think you can do better on location than this Airbnb, especially for first time visitors. 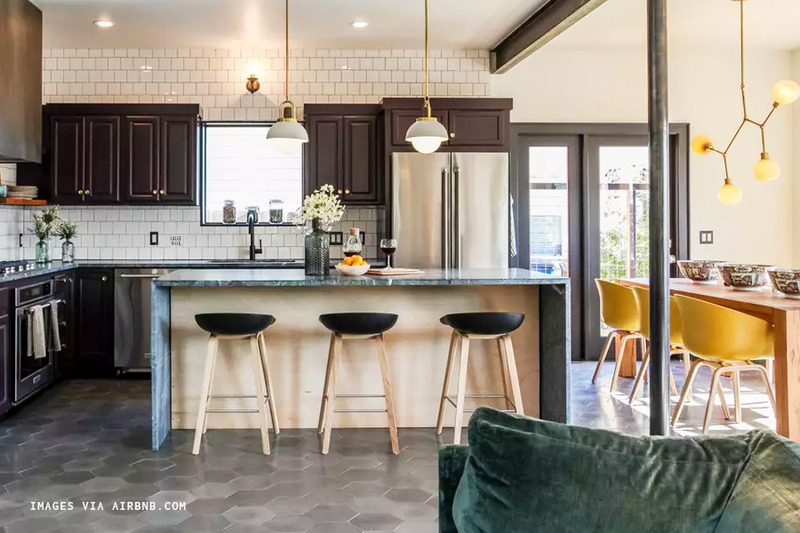 You’re walking distance to all the bars and restaurants on Cesar Chavez (including La Barbecue, if you want to get in line early) and close to the popular nightlife areas: Rainey Street and East 6th Street. The exterior of this home is so unique and the spacious (by New York standards) kitchen is perfect for people who love to cook. It’s also one of the few homes for big groups I’ve seen that actually has 2.5 baths, meaning less holding your pee and fighting over the shower. They even have an Ofuro soaking tub on the (private) balcony if you’re into that. Accommodates up to 6 people. 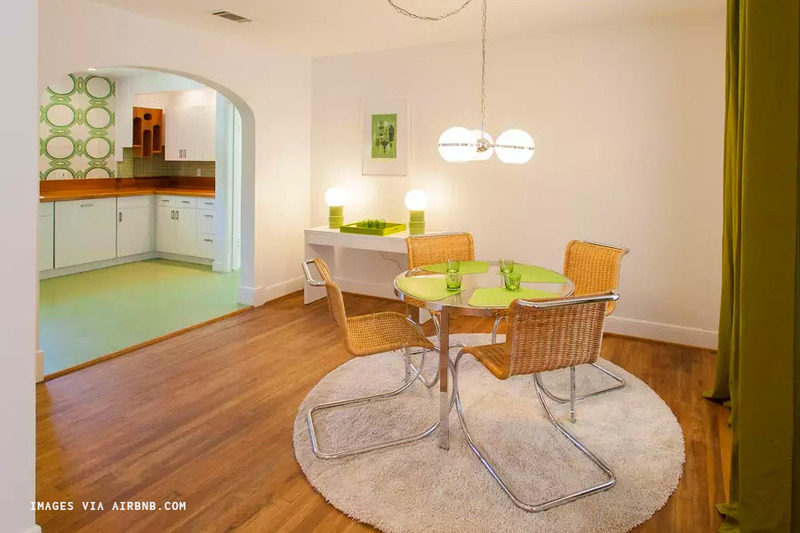 This home was originally built in 1954 and exemplifies mid-century modern. I love the green and orange themed vintage furniture and the custom tile (made in Nicaragua) in the kitchen. 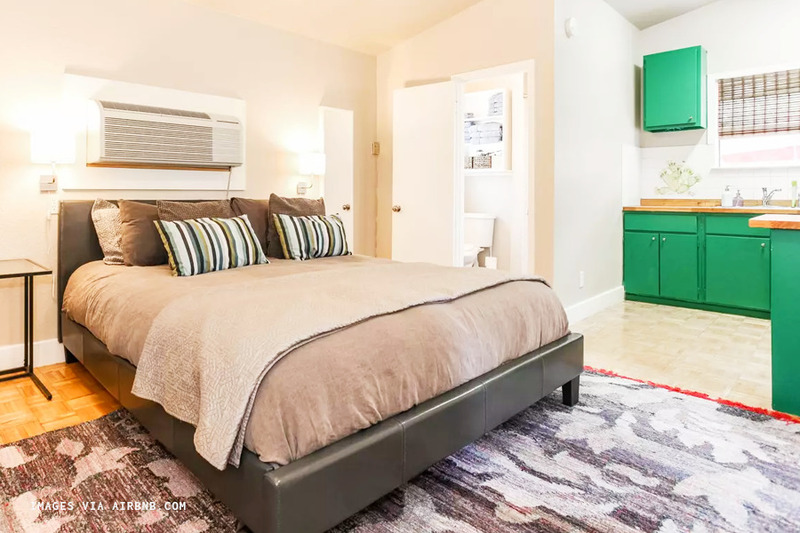 The Airbnb is located on Austin’s east side, walking distance to many great restaurants and nightlife. Accommodates up to 6 people. Admittedly, this home looks more like what I would expect to find in L.A., like the set of a crazy party in a Bret Easton Ellis novel. But that’s what makes its presence in Austin weird and therefore… appropriately Austin? Enjoy browsing the home’s art collection and discovering cool oddities like the giant “bird bath” tub or jungle-themed bathroom. Accommodates up to 7 people. It may be called a “hostel” but you won’t find raucous partying or youths here. 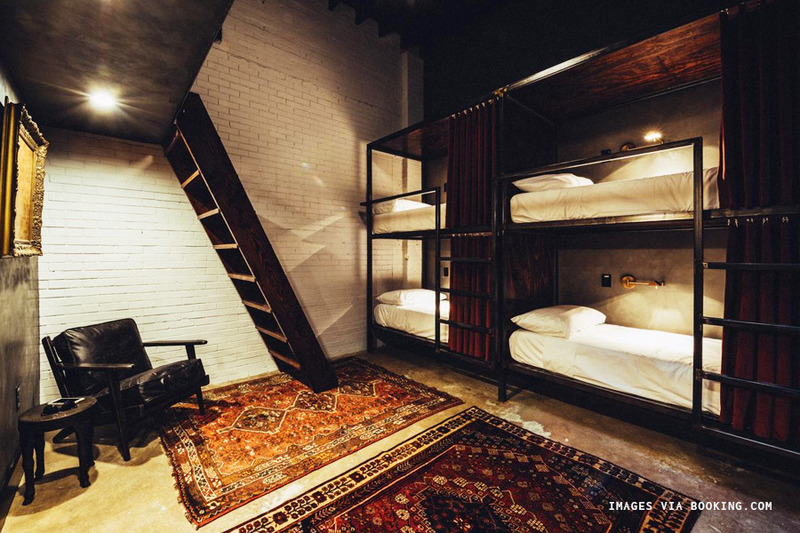 The group behind Native Hostels set out to design a hostel for adults and it shows in the decidedly grown-up decor. It’s also got a great location, straddling the border between the younger, dirty 6th-area and the quieter but still happening East Cesar Chavez Street. 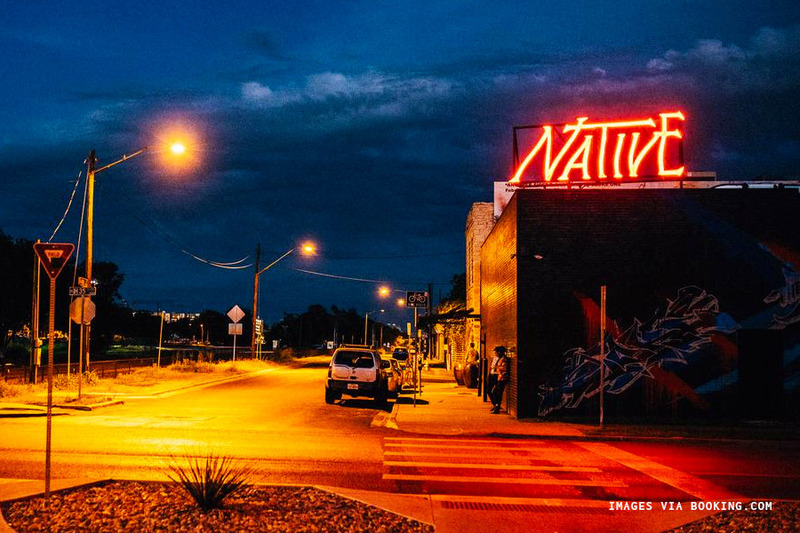 Native Hostel has facilities for disabled guests and a hypo-allergenic room available. 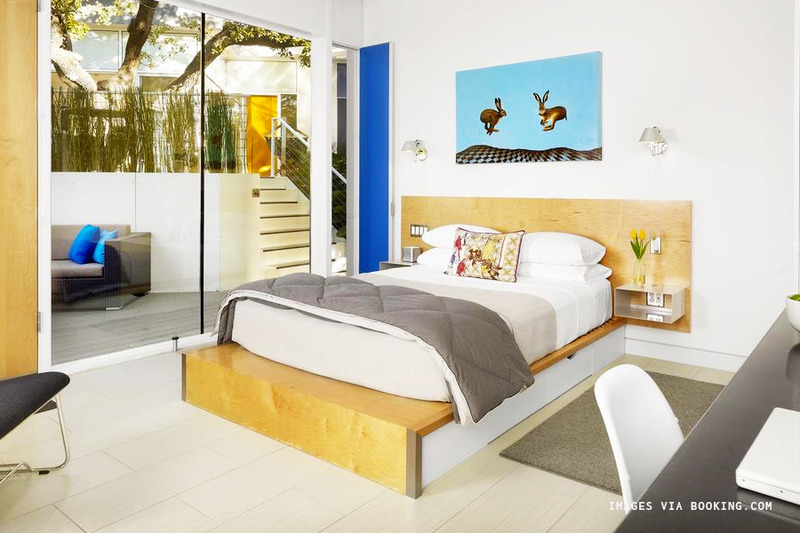 Staying at the Kimber Modern is what I imagine a sleepover in a modern art museum would be like. 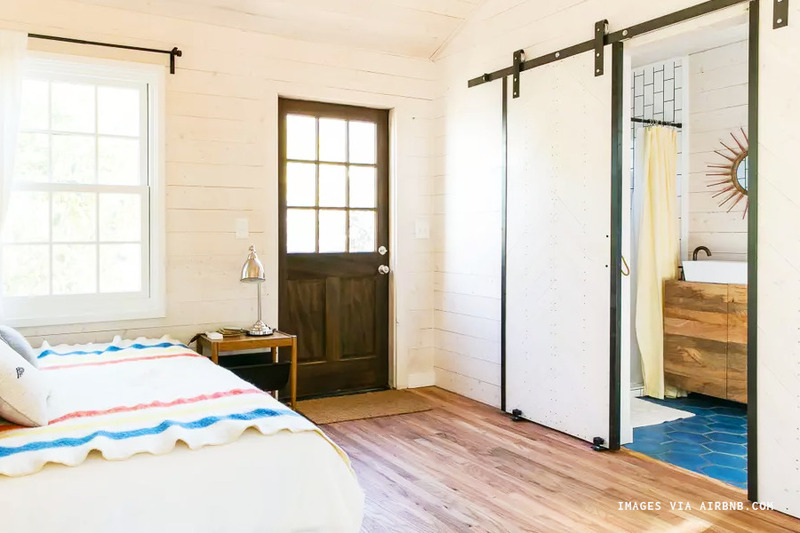 The hotel was conceived of by a local couple who wanted to channel their traveling experiences into designing the perfect place to stay (truly, ladies after my own heart). The hotel only has five rooms and one of the owner’s main goals was to make each room as quiet as possible: hence investments in a $44,000 Mitsubushi heating system that is virtually noiseless, and “Quiet Rock”, a sound-insulating drywall. 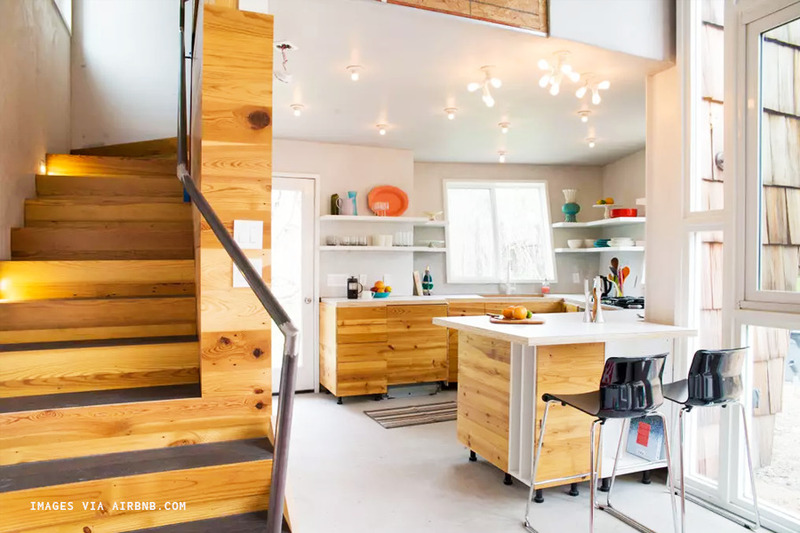 Rooms at the Kimber Modern are only accessible by stairs. 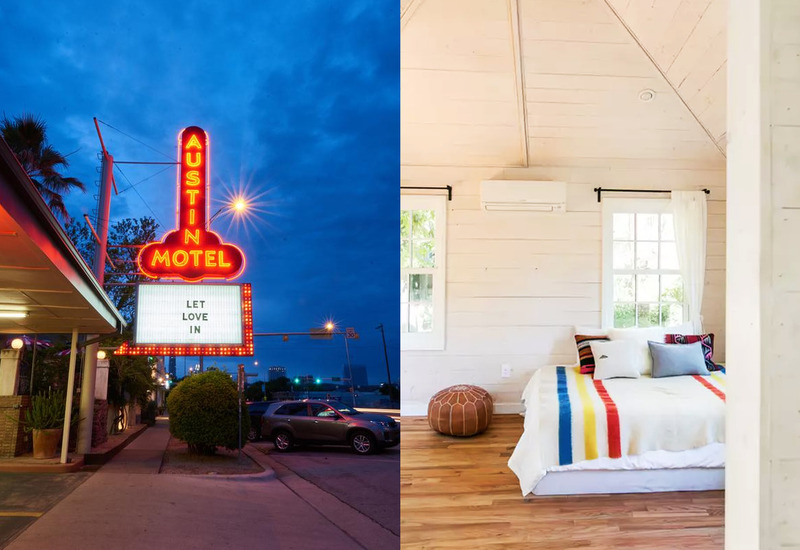 Originally a bungalow built in 1925, the Heywood refurbished itself as a 7-room hotel on Cesar Chavez Street in East Austin (my favorite location, if you couldn’t tell by my other recommendations). 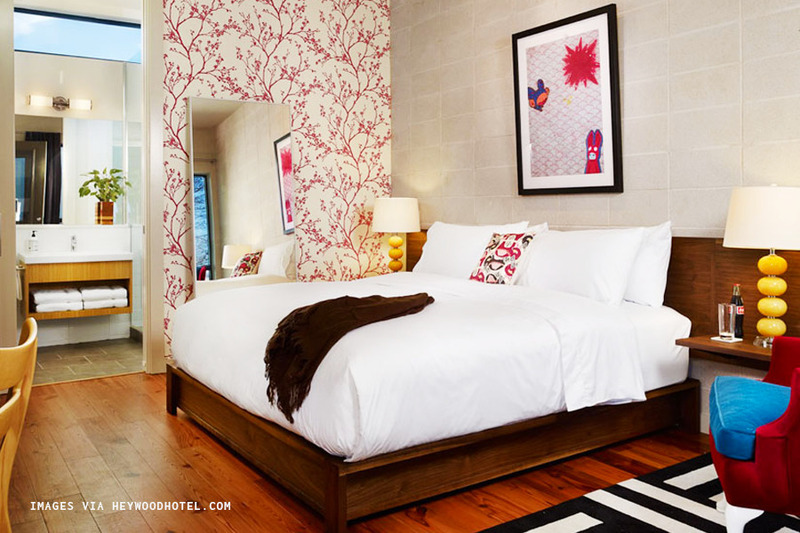 All the beds in the hotel sit on walnut wood platforms handmade by one of the owners, along with other artisans crafts and furniture throughout which guests are able to purchase. Your stay also comes with free bicycles for use. Heywood Hotel has wheelchair accessible rooms on the ground floor and a wheelchair accessible lobby. All rooms are non-smoking. The Austin Motel has been around since 1938, when it earned itself the nickname of “The Phallus Palace” (the shape of the sign should give that one away). 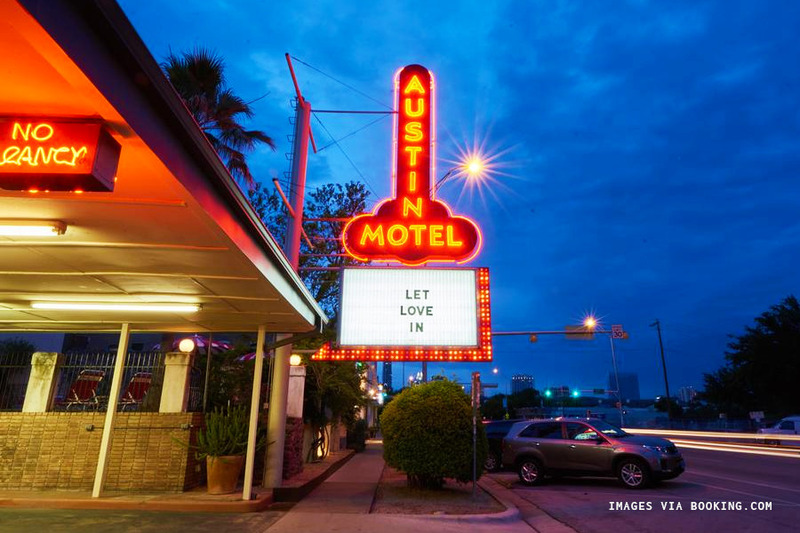 The historic motel has recently come under the management of the group behind Austin’s well known Hotel San Jose and Hotel Saint Cecilia. 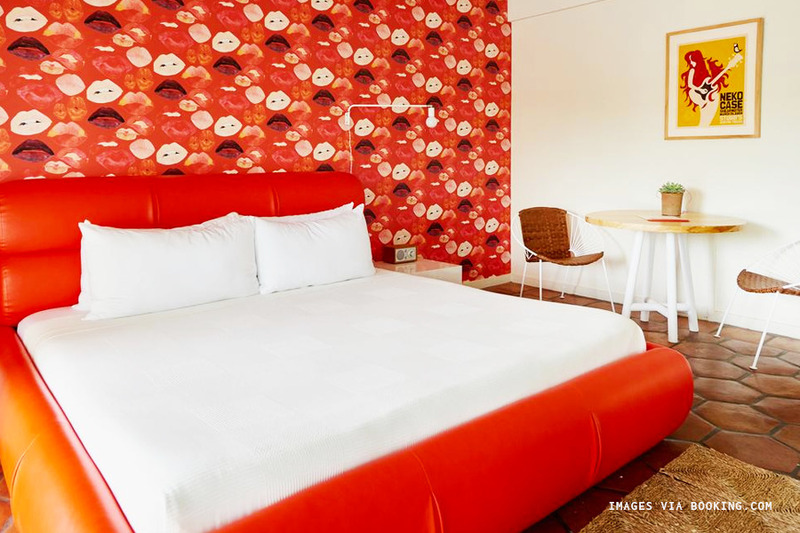 It recently reopened with updated furnishings, including custom wallpaper by https://voutsa.com/ that references the original, retro designs. 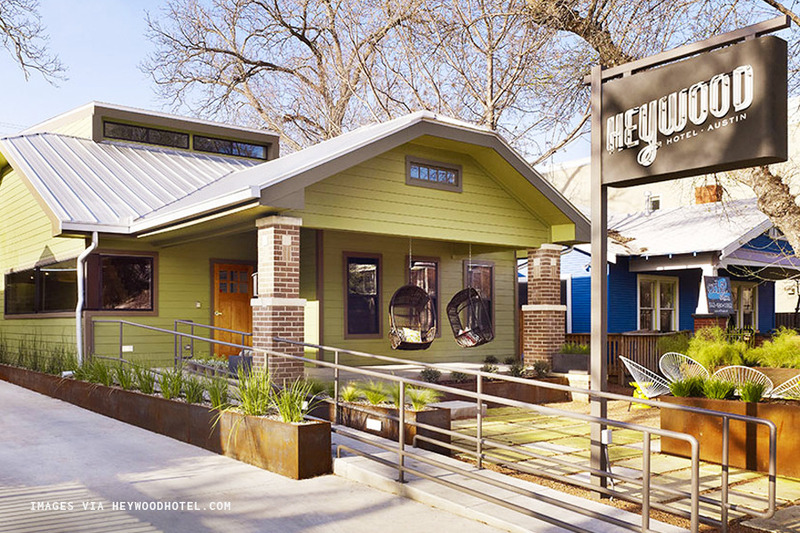 The attached restaurant is still under renovation but for now you can relax at the poolside bar, explore South Congress, hang out in the courtyard, or even walk a few blocks to its new sister hotels. Austin Motel is wheelchair accessible. Whether you decide to stay in an Airbnb or at a hotel, we highly recommend renting a car in order to fully experience everything has to offer. If you plan on staying inside the city limits you could very well get by with ride-sharing apps, but if you’re interested in checking out some of the incredible nature outside of the city, rent a car! 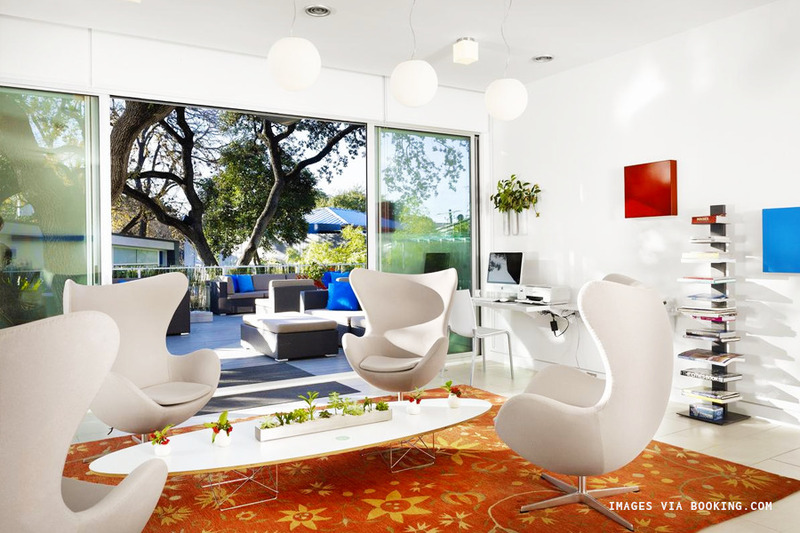 Read more about what to do in Austin here.